Thank you for joining Deborah and me for another MeatlessMonday! It’s finally fall and it’s harvest time! It’s also Monday, Meatless Monday, which calls for a power bowl/salad that’s packed with all our favorite fall flavors! I don’t know about you but I cannot get enough squash and apples when fall comes! Beets well that’s like avocado I need them year round. Wild rice and cranberries are also being harvested right now. There’s a lot of flavors and textures going on in this bowl/salad that all balance each other out and leave you feeling good! This past weekend I went to the worlds largest Cranberry Festival, CranFest, in Warrens Wisconsin with my friend. We have been talking about going for 5 years and finally we made it happen! I got to take a tour of the cranberry marshes and see cranberries being harvested. There weren’t as many cranberry foods as I was hoping but I did get some Ocean Spray products that aren’t sold in stores like some orange, strawberry, and raspberry flavored Craisins as well as some cranberry bloody mary mix. I picked up some delicious cranberry creamed honey, lots of balsamic vinegars (like 6 bottles! cranberry, pear, blueberry…and some crazy flavors like dark chocolate and espresso that are so yummy) and olive oils (mmm blood orange olive oil), even white truffle oil! Oh and only 10 pounds of fresh cranberries! I’m feeling inspired and cannot wait to start playing in the kitchen but I won’t be doing that until this coming weekend, well except making the girls some cranberry muffins, scones, and maybe bars that they requested because I’m starting a juice cleanse today. Stay tuned to my Instagram because I have a giveway for the juices I’m drinking this week coming next week, but if cleanses aren’t for you don’t worry a variety juice pack is also an option! Back to this delicious bowl/salad. This is another great dinner for when you might be short on time because hey life gets crazy sometimes. I’m not a batch cooker, well at least planning out a week of meals, because I often change my mind and like to eat based on the mood or what we have going on which sometimes changes. However I do like roasting veggies, squash, and potatoes to have on hand for quick lunches and dinners. With no real ideas in mind on how I will eat them and honestly my family will snack on roasted veggies I have in the fridge like sweet potatoes, squash, beets even brussels sprouts so even if I roasted something the day before it might not be there when I go to grab it the next day. Some days, like today when I’m sitting on the grass on the sideline of a soccer field typing because the girls have back to back soccer practice or training, I like to prep dinner that day or the night before. With soccer consuming almost every night of the week I will cook rice and roast veggies during the day to either eat cold for dinner or quickly heat back up. As much as I love eating dinner together as a family some nights it’s not going to happen because they aren’t going to eat dinner at 4pm or 8pm and they don’t do well eating a lot before playing soccer. I’ve come to appreciate eating on the sidelines, it’s like a picnic. Haha! Sometimes I like power bowls, they are also great for kids to try new things or who don’t like things all mixed together, other times salads. 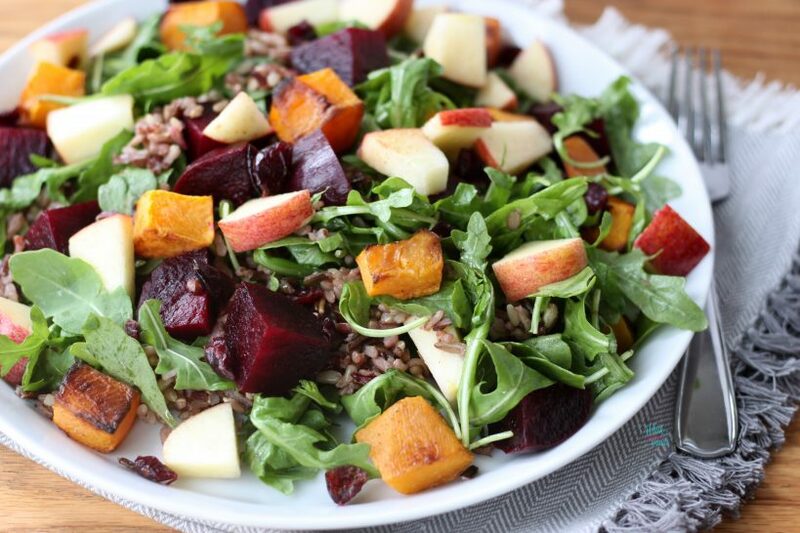 Either way this one is packed with peppery greens, wild rice blend, roasted squash, crisp tart apples, roasted beets, and dried cranberries that will have your taste buds dancing! Optional as a salad I use the following for dressing the greens. Preheat oven to 400F. Start rice on the stove, cooking according to package instructions. Line a baking sheet with foil and spray with coconut oil or olive oil spray. Spread butternut squash cubes on prepared baking sheet, spray with coconut or olive oil spray and sprinkle with sea salt and a little fresh ground nutmeg. Roast squash for 20-30 minutes turning half way through. Cut apples into quarters and remove seeds, cut quarters in half and than into bite size chunks. Toss apples with lemon juice. Cut beets into eighths. 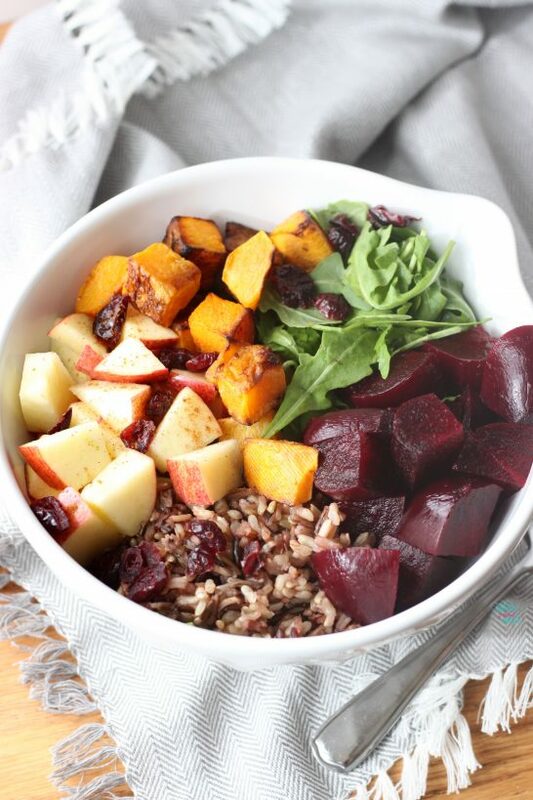 To assemble bowls add arugula, wild rice, roasted squash, beets, apples, and dried cranberries. Sprinkle with a little cinnamon. Enjoy! To make salads shake dressing ingredients together in a small container with a tight lid. Toss dressing with arugula. Toss arugula and wild rice together and divide between plates. Sprinkle apples with a dash of cinnamon. Top with butternut squash, beets, apples, and dried cranberries. Enjoy! 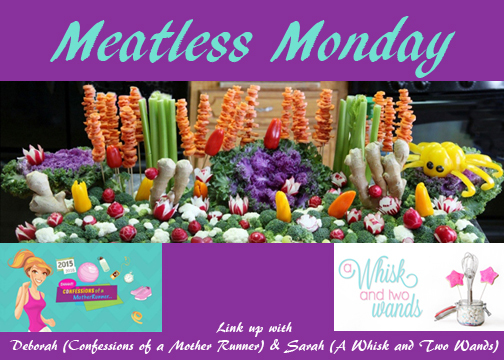 I’m also sharing in spreading the Meatless Monday inspiration and fun and linking up with Running on Happy and The Fit Foodie Mama for their Meatless Monday link up! This looks delicious! I love that you added cinnamon and nutmeg! Thank you! I love the balance of savory and sweet! The cranberry fest sounds so fun! Thank you Mary Ellen! All the roasted veggies right now and I love adding in a little sweet with the apples, especially since we have them from the orchard! They make quick, easy, delicious, healthy dinners! Thank you! Great minds think alike, I love the combination of all the fall flavors! WE are on the same page again today! I almost put sweet potatoes in my salad as well. Yay to yummy fall salads. Have a great day! Yes we are! There are so many options and combinations I could eat roasted veggie bowls and salads every day! 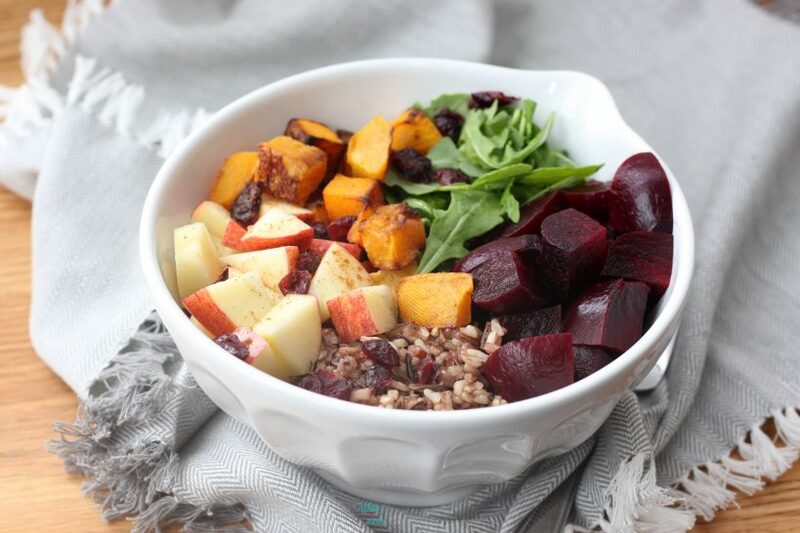 All the goodness of Fall in one bowl! Perfect and so love cranberries! We love it! I am going crazy not playing in the kitchen with all my cranberries right now! So many ideas! I love the rice in this to really amp up the filling factor. Such a gorgeous salad! I’m so inspired today to make a delicious salad dinner! Yes it’s very filling, but not heavy. Thank you, so happy to inspire you! delicious!!! I am so ready for all the fall foods! It’s one of the best times of year! Beets and butternut squash. Mmmmm!!! This made me drool. This looks like a pretty perfect rendition of fall! The festival sounds so fun! All of those balsamic vinegars… and the white truffle oil! I still haven’t taken the plunge to splurge on that, I need to do that. It’s SO GOOD. This bowl sounds great – it has so many great components to it, the squash & beets. And wild rice. And the sweetness with the cranberries & apple would just make the flavours pop. CranFest sounds great and it sure seems like you picked up lots of goodies! 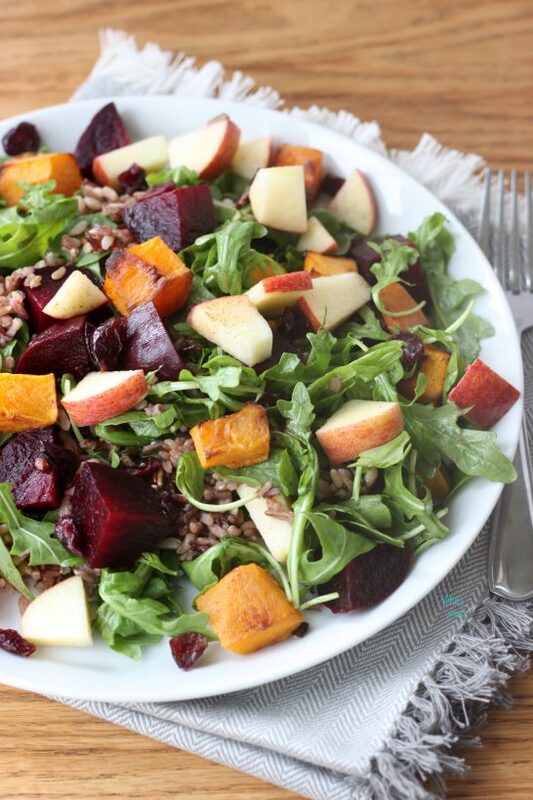 This salad is an absolute perfect celebration of fall- yum!